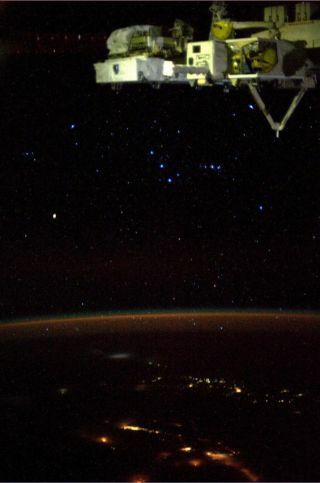 Astronaut Karen Nyberg tweeted a photo of the constellation Orion taken aboard the International Space Station. Tweet dated August 15, 2013. Every summer in mid-August, when I'm stretched out on a long lawn chair in the predawn hours scanning the skies for Perseid meteors, I'll always pause before the break of dawn to watch for Orion the Hunter's rise in the sky. At that time of the year the nights are balmy and even in the early hours of the morning you rarely need more than a sweater or light jacket to stay comfortably warm. Seeing the constellation Orion emerging from beyond the eastern horizon at that warm time of the year is a signal that we are turning the corner meteorologically speaking, and that soon the nights will be growing progressively chillier. On winter evenings, Orion dominates the sky, surrounded by numerous striking constellations, all decorated with brilliant stars. Indeed, Orion is by far, the most brilliant of the constellations and is visible from every inhabited part of the Earth. As darkness descends this month, Orion clearly dominates the southeast sky. Three bright stars decorate Orion's belt, which points northward to the Hyades and Pleiades star clusters of Taurus, and southward to the Dog Star Sirius. Within Orion we find two immense stars, Rigel and Betelgeuse, representing two entirely different periods of a star's life. Rigel is a star reaching the prime of its life. It's a true supergiant: a blazing white-hot star of intense brilliance and dazzling beauty. Located 860 light-years from Earth, its computed luminosity is roughly 130,000 times the brightness of the sun. It ranks as the seventh brightest star in the night sky at magnitude +0.12. Betelgeuse, by contrast, shines with a cool, dull ruddy hue and is located 643 light-years away. It is an irregular pulsating supergiant star, nearing the end of its life. It is expected to become a supernova sometime within the next million years according to scientists, and as such it expands and contracts spasmodically. Incredibly, Betelgeuse's diameter can vary between 550 to 920 times the diameter of our sun. If it were possible to shrink the sun down to the size of a baseball, Betelgeuse could be represented by a balloon ranging in size from 100 to 176 feet (30 to 54 meters) across. Starting in 1993 and continuing for at least 15 years, its radius shrank by 15 percent, an astonishing amount for so short a time. As a consequence of this shrinking and swelling, it has a variable brightness generally peaking as bright as 0.0 and appearing as dim as +1.3. In 1933 and again in 1942, it shone as bright as magnitude +0.2 making it brighter than Rigel. Its average magnitude of +0.45 ranks it as the ninth brightest star in the night sky. As is also the case with the mighty Hercules, the figure of Orion has been associated in virtually all-ancient cultures with great national heroes, warriors, or demigods. Yet, in contrast to Hercules, who was credited with a detailed series of exploits, Orion is more of a vague and shadowy figure. The ancient mythological stories of Orion are so many and so confused that it is almost impossible to choose among all of tem. Even the origin of the name Orion is obscure, though some scholars have suggested a connection with the Greek "Arion," meaning simply warrior. All, however, agree that he was the mightiest hunter in the world and is always pictured in the stars with his club upraised in his right hand. Hanging from his upraised left hand is the skin of a great lion he has killed and which he is brandishing in the face of Taurus, who is charging down upon him. Below Orion's three-star belt is undoubtedly one of the most wonderfully beautiful objects in the sky: the great Orion Nebula. It appears to surround the middle star of a fainter trio of stars in a line that marks the hunter's sword. The nebula is invisible to the unaided eye, though the star itself appears a bit fuzzy. It can be seen in good binoculars and small telescopes as a bright gray-green mist enveloping the star. In larger telescopes it appears as a great glowing irregular cloud. The nebula emits a glow produced by fluorescence from the strong ultraviolet radiation of four hot stars entangled within it. Edward Emerson Barnard (1857-1923), for many years an astronomer at Yerkes Observatory, once remarked that it reminded him of a great ghostly bat, and he always experienced a feeling of surprise when he saw it. The Orion Nebula is a vast cloud of extremely tenuous glowing gas and dust, approximately 1,300 light-years away. The nebula is about 24 light-years across (or more than 20,000 times the diameter of the entire Solar System). Astrophysicists now believe that this nebulous stuff is a stellar incubator; the primeval chaos from which star formation is presently underway. Editor's Note: If you snap an amazing night-sky photo and would like to share it with SPACE.com for a possible story or gallery, please send images and comments (including your name and the photo's location) to managing editor Tariq Malik at: spacephotos@space.com. Joe Rao serves as an instructor and guest lecturer at New York's Hayden Planetarium. He writes about astronomy for Natural History magazine, the Farmer's Almanac and other publications, and he is also an on-camera meteorologist for News 12 Westchester, N.Y.Follow us @Spacedotcom, Facebook and Google+. Original article on SPACE.com.